Newport is a nice place. Of all the ports where we could be stuck, I’m glad we’re stuck here. The weather just isn’t cooperating for a hop to Cape May, NJ, or even Sandy Hook, NJ on the northern end of the state. The wind vacillates around the West/Southwest/South directions, none of which are ideal for where we want to go because we need to go exactly those directions! It’s not that we mind sailing upwind, we’d just rather not have to actually tack back and forth. The waves are also kinda big and high wind + thunderstorms are in the forecast as well. At least Newport has a lot to offer. Lee and I been spending way too much time in front of our computers. To balance that out, we’ve been running almost every morning. This is such a great place to run! We shower at the Seaman’s Institute onshore and bike to various other destinations. Friday and Saturday nights we hung out with Lee’s college friend Mr. C and his girlfriend Sri, who live in Tiverton, RI. They took us to an amazing restaurant in Newport and then made us dinner at their house the next night. We’re getting kinda spoiled! Tomorrow night they’re coming to the boat for dinner so at least I get a chance to reciprocate. This is what we saw when we were getting ready to go ashore on Friday. 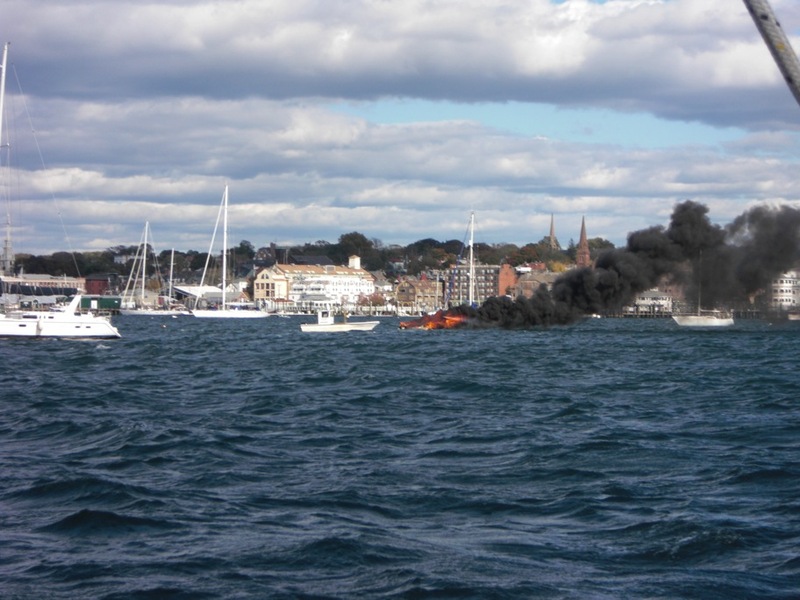 A boat on fire not that far from us. It was a small sailboat that looked abandoned. It burst into flames, burned to a crisp (losing sail, rigging, and mast), and sank in less than 10 minutes. We took pictures. The anchor line burned through pretty quick and the boat drifted downwind fast. It was blowing 25 knots all day. The harbor master came over to check it out and make sure there was no one onboard and the fire department watched from shore. 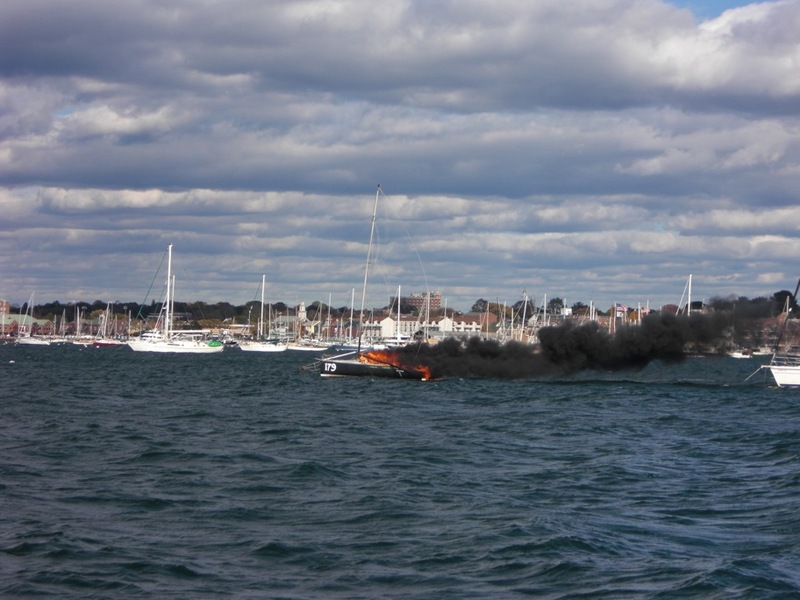 Another boat at anchor escaped a flaming end by only a few feet as the fireball boat drifted past. We think wet batteries probably started the fire. That’s why we have boat insurance!